What is Norit used for? How do you have to take Norit? In which cases are you not allowed to take Norit? The effective substance in Norit consists of active coal, or carbonized plant remains. This substance can absorb certain toxic substances which are in the intestines, so that these are made innocuous and they leave the body with the stool. Norit can be purchased without a prescription and it is available in different variations. Norit is usually used for diarrhoea which is the outcome of an intoxication, for example from swallowing harmful substances. 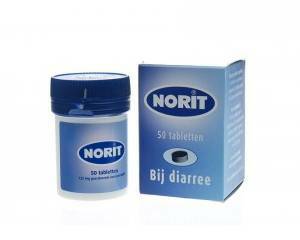 Furthermore, Norit is used when the patient has acute (travel-)diarrhoea, often in combination with a diet. Norit makes the harmful substances leave the alimentary canal, so that the complaints, such as watery stool and belly cramps, are relieved. Norit is available as capsules and as regular pills, which have to be taken in its whole form with some water. It does not make a difference if you take the pills in combination with a meal or not. If you have diarrhoea, the pills should be taken regularly and spread throughout the day. If you have an intoxication, your doctor will determine when and how you have to take this medication. Do not take Norit for a long time! The active coal not only absorbs harmful substances but also valuable nutritions. Adults and kids who are older than 2 years: three times per day 6-9 pills à 125 mg. The maximum amount of pills to be taken should not be higher than 27 pills per day. There are different dosages for Norit capsules with a different strength. You can find these in the package insert. Please do not take this medication longer than three consecutive days without a consult with your doctor! Please read the package insert before taking Norit! Black stool. This is caused by the coal in Norit. As soon as you stop taking these pills, your stool will be coloured normally again. Warning: Norit can have an influence on the effectiveness of your contraceptive pill! Please use an additional contraceptive, if necessary! In the package insert, you can find more Information regarding the side effects. suffer from a severe constipation in your gastro-intestinal system. You can find more information about contra-indications in the package leaflet. As far as it is known, Norit can be taken without any problems during a pregnancy or while a woman is breast feeding. There are no constraints as regards driving or the consumption of alcohol.